Since 2009, the Academy has been handing out its Honorary Oscars at the Governors Awards, an annual event designed both to give the honorees a fuller, more lavish presentation and to shorten the Oscar show by moving the honorary awards a night of their own. 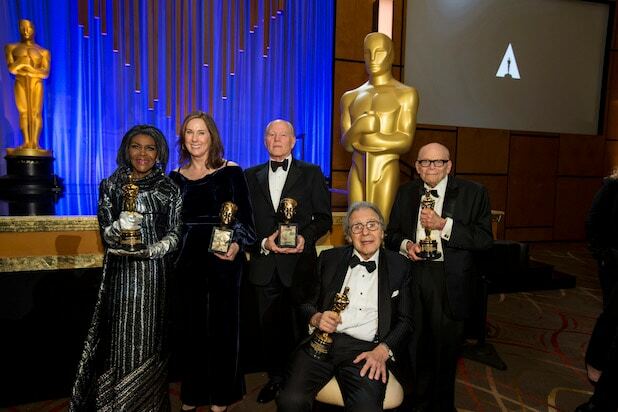 Sunday night marked the 10th Governors Awards, with Honorary Oscars handed out to publicist Marvin Levy, film composer Lalo Schifrin and actress Cicely Tyson, and the Irving G. Thalberg Memorial Award going to producers Kathleen Kennedy and Frank Marshall. As usual, the event in the Ray Dolby Ballroom at Hollywood & Highland was partly an emotional evening devoted to honor deserving artists, and partly one of the most lavish campaign stops of awards season. At the beginning of the night, Academy President John Bailey mentioned the five honorees, one by one. All received enthusiastic applause – but the biggest hand clearly went to Levy, best known as Steven Spielberg’s longtime publicist. “Did Marvin get the most applause because there are so many publicists here?” asked one attendee, who happened to be, yep, a publicist. And that was probably a good guess – because in a room where many of the tables were packed with talent from virtually every Oscar-contending film, lots of PR reps were on hand to facilitate the schmoozing that has become the lifeblood of the Governors Awards. 2. The “Popcorn Oscar” is still the elephant in the room. 3. The Governors Awards might just set a record for the largest amount of Wolfgang Puck food left uneaten. Here’s the problem: After Bailey’s remarks, the program took an hour-long break for dinner. But when Lady Gaga was over here and Nicole Kidman was over there and Chadwick Boseman was sporting a knee-length red jacket and every large or small movie had a presence in the ballroom, and the people in the room who weren’t affiliated with an Oscar contender were either voters or press – well, nobody really sat and ate. Instead, you got a dinner break devoted to table hopping, mingling and schmoozing – pretty much everything except eating. Meanwhile, Wolfgang Puck’s braised short rib and hearts of palm went uneaten on many a plate – though “Green Book” star Viggo Mortensen, for one, actually tried to eat before being pulled away by well-wishers. 4. It pays to leave the Board of Governors. Two of this year’s honorees, Levy and Kennedy, were longtime members of the Academy’s Board of Governors. But AMPAS rules say that you can’t give a Governors Award to a sitting governor, so their recent exits from the board cleared the way for their awards. Kennedy’s case was particularly noteworthy, because she is the most high profile in a number of longstanding members of the board who have opted to leave in recent years. While producer Bill Mechanic made the flashiest departure, with a scathing letter to Academy president John Bailey that slammed AMPAS management, Kennedy had spent years not only as a board member but as an officer. It was understood that the job of Academy president was hers for the asking – but instead of seeking another term on the board during a tumultuous time for the Academy, she opted not to run for re-election this year. And that meant they could vote her the Thalberg. 5. It also pays to be close to Steven Spielberg. Spielberg isn’t on the board anymore, either, but his shadow hung over the Governors Awards. Levy, who first worked with the director when he was the only member of the Columbia Pictures marketing team who liked Spielberg’s proposed poster for “Close Encounters of the Third King,” is his longtime publicist. Marshall has produced 10 of Spielberg’s films, Kennedy more than that. So at the end of the show, it made perfect sense that it was Spielberg onstage handing out the last award. 6. A TV theme song trumps everything else Lalo Schifrin wrote. The Argentinian composer has a long history of classic film scores, including “Cool Hand Luke,” “Bullitt,” “Dirty Harry” and many more. And you have to figure that the board voted him his Honorary Oscar for his film scores, right? It ended the film package paying tribute to Schifrin’s work, and it was also the first joke in presenter Kathy Bates’ introduction to the portion of the show devoted to him – although she sort of pretended that it was movie music. 7. 88 + 86 = entertainment. After Bates’ speech and the film clips, the award to Schifrin was presented by Clint Eastwood. The actor-director, who is 88, and began his presentation by saying he can’t see the TelePrompTer anymore and just wanted to ask Schifrin some questions. So Schifrin, 86 and not exactly spry, slowly and painstakingly making his way to the stage, where the two men tried to figure out how many movies they’d made together. Finally, Schifrin, realizing it was probably time for him to give his acceptance speech, cut short his presenter’s entertaining ramblings. “It was nice talking to you,” he said to Eastwood, who (mostly) retreated out of microphone range and let the Oscar winner speak. 8. Cicely Tyson is a queen. Quincy Jones reinforced that notion in his speech, as did Ava DuVernay in hers -which began when she mentioned that she’d asked a number of prominent African American women to describe Tyson in one word, and Oprah Winfrey offered the word regal. And the 93-year-old Tyson, even as she described her reaction on learning of the award (“I just cried and cried – I couldn’t even say ‘thank you'”), was eloquent, emotional and every inch the queen that Perry had described. 9. Spielberg once caught Kennedy and Marshall making out on his couch. 10. Change is still in the air. It was a night of relatively few political speeches, a night mostly devoid of the kind of promises of diversity or inclusion that have been heard at previous Governors Awards. But the awards themselves spoke to a certain amount of inclusion: Levy is the first publicist ever given an Oscar; Schifrin only the third composer to win an honorary award, after Alex North in 1985 and Ennio Morricone in 2006; and most notably, Kennedy is the first woman to ever receive the Thalberg Award. And then she moved on to a larger theme. “We all know there are changes in our industry that must be enacted,” she said. “As our industry grows and changes, who gets to tell their stories needs to grow and change as well. Each of us has the obligation to ensure that everyone who has a story to tell has the same opportunity that most of us have had.